Written by admin on August 17, 2015 . Posted in Announcements. Lunch with 5 top space scientists. It was fascinating. Space truly is the last frontier and some of the developments there in astronomy etc. are like science fiction, except they are real. I learned that our shuttle capacity is such that we could orbit 300 people. NASA’s Space Shuttle program at the time held a maximum of eleven people per shuttle, and only five were built for space flight. Even if all five took off together, it would be impossible to place and maintain 300 astronauts in orbit. Finding the truth behind Reagan’s extraordinary revelation requires diving deep into the shadowy world of highly classified aerospace programs. The problem in doing so is not only that public documentation is at best scant, if available at all, but that possession of documentary evidence of such programs can be illegal. There are severe penalties for possessing and/or disclosing classified documents to anyone unauthorized to view them. It takes a brave whistleblower to come forward to disclose what he or she knows about classified aerospace programs. A new book, Insiders Reveal Secret Space Programs & Extraterrestrial Alliances, introduces a number of whistleblowers who have made extraordinary claims regarding secret space programs that they either directly served in and/or were briefed about. In particular, the book investigates the extraordinary claims of Corey Goode concerning five secret space programs that he was directly involved with and/or been briefed about. Goode says he completed a 20 year tour of duty from 1987 to 2007 in several of these programs. He reveals that in the course of his duty, he came into direct contact with different extraterrestrial groups and alliances that interacted with one or more of the space programs. Goode’s position allowed him unrestricted access to “Smart Glass Pads” that had extensive information about highly classified history, science, medicine and other topics related to secret space programs and extraterrestrial life. Goode further claims that in early 2015, he was made the delegate of an alliance of newly arrived extraterrestrial visitors. This included a group called the “Blue Avians,” who facilitated meetings that he attended between the different secret space programs and/or different extraterrestrial alliances. He says that these new visitors have superior technologies in comparison to anything previously witnessed, and have implemented a solar system wide quarantine, which directly impacts all the space programs and other extraterrestrial groups, in tandem with the entire citizenry of Earth. Available public documents along with other whistleblower testimonies help corroborate many of Goode’s claims, and provide an overall context for understanding the full scope of the multiple secret space programs. His testimony provides clear answers as to what Reagan was briefed about in 1985, and why the latter’s repeated offers of global cooperation to face an alien threat led to the sharing of classified space technologies that ended the Cold War. Learn from this book: how the Vril/Nazi flying saucer programs in the 1930’s gave birth to the ‘Dark Fleet’; how Project Paperclip scientists both helped and hindered the development of the US Navy’s ‘Solar Warden’; how the MJ-12 Group was behind the creation of the ‘Interplanetary Corporate Conglomerate’; and how Ronald Reagan was instrumental in the creation of the ‘Global Galactic League of Nations’ space program. Finally, learn how the Sphere Being Alliance and other extraterrestrials interact with these and other programs. The full disclosure of secret space programs and extraterrestrial alliances will unshackle the chains of deception holding humanity back from reaching its highest potential as galactic citizens. About the Author: Dr Michael Salla is a former university professor in international relations, and is the author of Kennedy’s Last Stand: Eisenhower, UFOs, MJ-12 & JFK”s Assassination (2013), which has received many “outstanding” reader reviews; and author/editor of eight other books dealing with ‘Exopolitics’, International Conflict, U.S. Foreign Policy and Global Peace. Insiders Reveal Secret Space Programs and Extraterrestrial Alliances is published by the Exopolitics Institute and is approximately 380 pages in length. Cost of paperback version is $18.95. Click here to Order. Advance orders begin shipping on September 15, 2015. Free U.S. Shipping for all orders over $25. Electronic Kindle Version available at Amazon.com on September 28, 2015. Please Note: a percentage of all book sales go to Corey Goode in financial support as he continues his whistleblower disclosures. We are on the verge of the biggest paradigm shift in human history. A world where the existence of intelligent extraterrestrial life becomes common knowledge. The signs are evident to all who are willing to see the changes that lie ahead. Soon, it will be common knowledge that extraterrestrial life exists and preparing can benefit you in many ways. You can prepare by doing something NOW to educate yourself. The Exopolitics Institute offers courses designed to educate you about extraterrestrial life, its various aspects and impact on human society. Watch this ExoNews TV Special to learn more! To learn more about Exopolitics Institute Certificate courses: click here. Written by admin on May 31, 2014 . Posted in Announcements. [May 31, 2014 – Exopolitics Institute News Service] On May 28, 2014 official representatives of the reinstated Kingdom of Hawaii released a declaration creating a sanctuary for extraterrestrial visitors to Earth. The “Declaration for Creating Hawaii Star Visitor Sanctuary” will make it possible for extraterrestrials to land on property set aside exclusively for hosting “star visitors” in the area of Kalapana on the Puna coast of the Big Island of Hawaii. 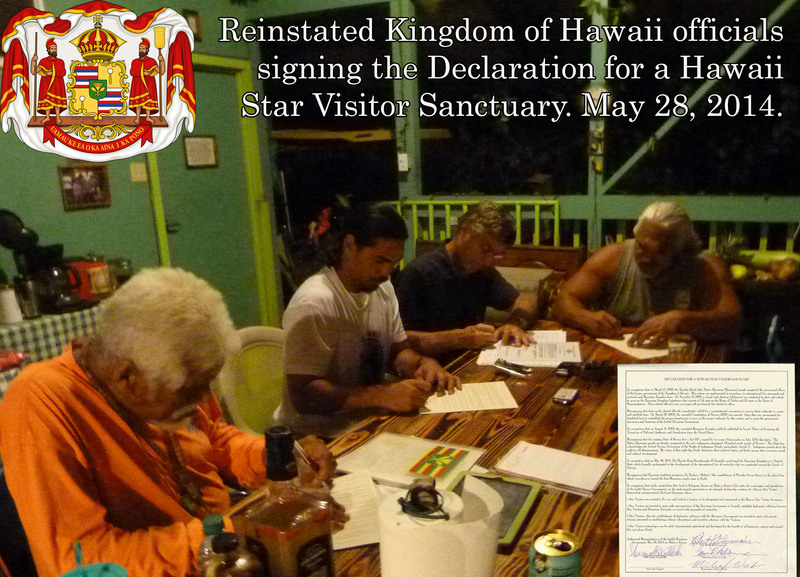 The “Star Visitor Sanctuary” will be on sovereign land claimed by the reinstated Kingdom of Hawaii. The Kingdom comprises a government led by a Prime Minister, elected representatives to two houses of Parliament, and a revised Hawaii Constitution. The area under the World’s First UFO Landing Pad was designated international by the Town of St. Paul as a symbol of our faith that mankind will maintain the outer universe free from national wars and strife. That future travel in space will be safe for all intergalactic beings, all visitors from earth or otherwise are welcome to this territory and to the Town of St. Paul. Weighing just over 130 tons the landing pad was officially opened by Canada’s then Minister of Defense, Paul Hellyer. Later in June 2006, Hellyer gave the keynote address at the Extraterrestrial Civilizations and World Peace Conference held in Kailua-Kona on the Big Island of Hawaii, again affirming his support for developing peaceful relations with extraterrestrial visitors. The Hawaii Declaration similarly declares the intention of establishing peaceful relations with extraterrestrial visitors. Drawing on the rich history of international neutrality that was practiced by the Kingdom of Hawaii prior to its illegal annexation by the U.S. the reinstated Kingdom aims to establish formal diplomatic relations with Star Visitors. The preamble to the Declaration points out that according to Hawaiian legend, the Na Huihui o Makali’i (the constellation of Pleaides/Seven Sisters) is the place from which the first Hawaiian people came to Earth. The Kingdom of Hawaii gains its authority from international law that never formally recognized the illegal annexation of the Kingdom by the U.S. government, and which has long recognized that the native Hawaiians right to self-determination was violated. This was belatedly recognized by the US Federal Government on November 23, 1993 by a joint resolution of Congress signed by President Bill Clinton (U.S. Public Law 103-150) that apologized for the illegal annexation of the Kingdom of Hawaii. The right of the Native Hawaiians to self-determination was also recognized by the Legislature of the State of Hawaii that passed a bill signed by Governor Bill Abercrombie on July 6, 2011. In recognition of the illegality of US annexation of the Hawaiian Islands and the inherent right to self-determination of native Hawaiians under international law, on March 13, 1999, representatives of the Hawaiian people reinstated the provisional offices of their former Kingdom with the purpose of holding elections to appoint a new Hawaiian government. The provisional government held a plebiscite on November 9, 1999 that resulted in the election of representatives to a bicameral system of government. The newly elected parliament passed a revised version of the last Kingdom of Hawaii Constitution on March 29, 2000, that enshrined the rights and powers of the lawful Hawaiian Government over the territories of the Hawaiian islands. Five duly appointed representatives of the reinstated Hawaiian government have signed the “Declaration for Creating Hawaii Star Visitor Sanctuary” thereby giving it full legitimacy and protection under the laws of the Reinstated Kingdom of Hawaii. In an exclusive interview, one of the signatories, (Uncle) Robert Keli’iho’imola, Sr., a noble within the reinstated Kingdom of Hawaii, explains where the Sanctuary will be located. He also describes how the reinstated Kingdom of Hawaii plans to help the general public prepare for extraterrestrial contact, and what he hopes will be achieved by the Sanctuary. On Friday, June 27. 2014, there will be a public ceremony dedicating the land assigned for the Hawaii Star Visitor Sanctuary, in accordance with Hawaiian tradition. The ceremony will occur on the first day of a Hawaiian Sustainability conference scheduled for June 27-29, at Uncle Roberts, Kaimu-Kalapana, Kingdom of Hawaii. All are invited to attend this free public event. The Exopolitics Institute is a sponsor for the creation of a Hawaii Star Visitor Sanctuary that will facility extraterrestrial contact in the Kalapana region of the Big Island of Hawaii. Currently, the Institute is hosting a temporary webpage featuring information and upcoming events associated with the Sanctuary. The Institute will be supporting various future events to be held at the Sanctuary that promote extraterrestrial contact.